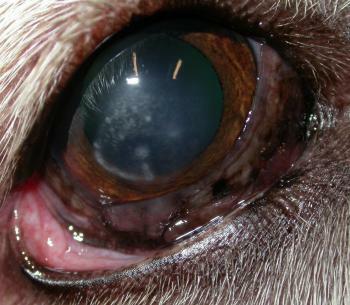 What disease processes are you seeing in the eye of this white 7 year old German Shepherd. What diagnostic tests might you employ and what treatment? Here’s his other eye – there are conjunctival follicles and third eyelid depigmentation caused by lymphocytic plasmacytic conjunctivitis (you can see another case with some histopathology by using the image search engine on the clinical cases page) and also corneal lipid deposits in each eye. I have asked about diet (he’s on James Wellbeloved) and taken a fasted blood lipid serum sample to assess what’s going on systemically. The dog is already on prednisolone acetate qid which isn’t holding things at the height of summer (a British summer mind you so not that much UV!) so we have moved on to topical cyclosporine in Optimmmune to see what difference that makes. 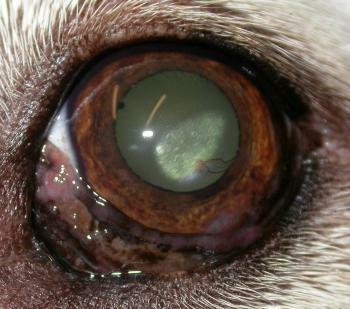 This entry was posted in Cases and tagged corneal lipdosis, dog, Plasmacytic lymphocytic conjunctivitis. Bookmark the permalink. Bad eye in a beardy!